Although a majority of the population of Georgia approves of the Government of Georgia’s stated goal to join the European Union (EU), reported trust in the EU declined between 2011 and 2015. According to Europe Foundation’s Knowledge and attitudes towards the EU survey conducted by CRRC-Georgia, 22%of the Georgian public reported fully trusting the EU in 2011. In 2013 and 2015, the respective shares were only 4% and 3%. The share of those reporting they “trust” the EU moderately, rather than “fully trust” it, also declined from 47% to 31%. Distrust in the EU, on the other hand, increased in all age groups (between 2011 and 2015) and all settlement types (between 2011 and 2015), both among men and women (between 2011 and 2015). Moreover, the EU is increasingly perceived as a threat to Georgian traditions, as described in a recent blog post. 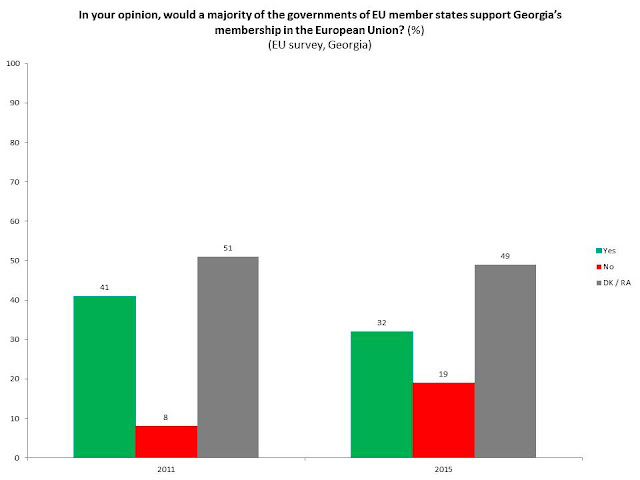 This blog post looks at the Georgian public’s changing perceptions of EU-Georgia relations focusing on how Georgians think their country is perceived by the governments and citizens of EU member states. In 2011, 41% of the population of Georgia reported believing that a majority of EU member states would like Georgia to enter the EU. Four years later, only32% gave the same answer, while the share of those answering negatively doubled. Importantly, almost 50% of the population cannot answer this question. Similarly, in 2015, 18% answered that, in their opinion, a majority of European citizens wouldn’t like Georgia to enter the EU, compared to 11% in 2011. The decline of the share of the population that believe the EU will welcome Georgia as a member state may be related to the finding that the population of Georgia sees their country’s EU accession as less likely. While 33% of the population of Georgia thought in 2011 that the country would join the EU in 5 years or less, 18% did so in 2015. Today, 16% of the population thinks Georgia will join the EU within ten years – twice the share of 2011. The share of those answering that Georgia will never join the EU rose from 2% in 2011 to 11% in 2015. Over time, the Georgian population thinks that citizens of the EU as well as the EU governments are less inclined towards integrating Georgia into the Union. More clarity and realism concerning Georgia’s potential for EU membership certainly could help to avoid a slow backslide towards less EU support for strong relations between Georgia and the EU in the years to come. The public should be aware that EU membership is a long-term prospect at best rather than an immediate future. This may avoid a sense of betrayal and frustration with slow progress. To explore the data in more depth, take a look at our online data analysis tool or take a look at some of CRRC’s recent blog posts (see here, here and here).